Dry fry the black peppercorn (without oil) on a low heat until fragrant, and set aside. 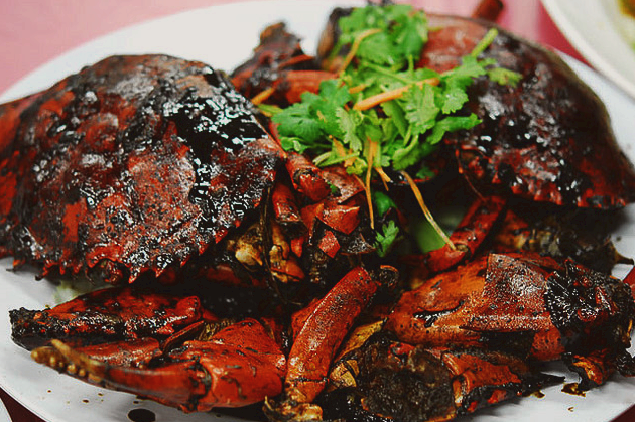 In a large wok, deep fry the crabs over high heat in quick succession. Do this a little at a time so as to maintain the high heat in the oil. Cook for 4 to 5 minutes till the crabs turn red. Transfer to a colander to drain off excess oil. Strain the hot oil and place the wok back on the heat. Heat the wok on a low heat with butter and add in shallots, garlic, salted soy beans, dried shrimps, black pepper, curry leaves and the chopped chilli padi. Stir fry for few minutes till you smell the peppery aroma. Add crab and the remaining ingredients except coriander leaves. Stir well until all the crabs are coated with the black pepper sauce. Taste. Turn the heat to medium and cook for 5-10 minutes until the crab is done. Dish out and garnish with some coriander leaves. Serve immediately with rice and other seafood dishes. Great recipe. This is a scrumptious dish. Followed this recipe and the crab taste fantastic! But I boiled the crab instead of frying them! It’s healthier. You are wellcome Cindy. Glad you tried out this recipe. Thanks to chef Rai for sharing. This was one of the most delicious, spicy and completely messy things I have ever eaten just as I remembered it in Singapore!